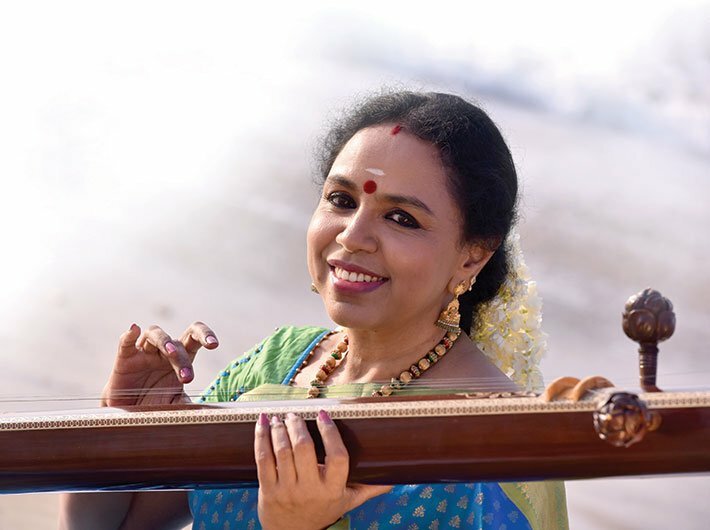 Sudha Ragunathan is a renowned Carnatic vocalist and composer. She has performed across India and abroad. Her guru was Padma Bhushan ML Vasanthakumari, known by many as a musical genius and a doyenne of Carnatic music. Sudha’s most fascinating and memorable performance was Vande Mataram at the central house of parliament during the 50th Republic Day celebrations in 2000. She has also performed at a concert organised by the United Nations. Apart from teaching music, she is the managing trustee of Samudhaaya Foundation that assists victims of national calamities, and works for underprivileged people. She was awarded Padma Shri in 2004 and Padma Bhushan in 2015. Tell us about your gurus and their role in your musical career. Music was always present in our family. My mother was my first guru. I have been playing around with notes! It was because of my mother’s perseverance and commitment in pushing me each and every time. My formal training began with Vidwan TV Viswanathan and BV Lakshman. Later, I got an opportunity to learn from the Padma Bhushan ML Vasanthakumari. How can Carnatic music’s scope and audience be increased? The scope is already increasing. Younger generation is now choosing it as their profession. Opportunities are plenty now. However, increasing the audience needs to addressed seriously. Though there are plenty of concerts being organised, the audience turnout is lean in most of these. Concerts have to be made more engaging. Gone are the days when concerts were held for three to four hours. Times have changed. Durations are shorter and audience wants essence captured in that short time. We can focus on lecture demonstrations, thematic concerts and singing new kritis and raagas. Tell us about Samudhaaya Foundation. What are the social causes you are working for? I was deeply moved by the Kargil war and wanted to do something for the families of war heros. I was already involved in social activities and sang in concerts to raise funds for charities organised by others. I wanted to have the individuality and the independence to do what I wanted and when I wanted, with nobody questioning it. Thus, I started Samudhaaya Foundation in 1999. After identifying a cause, we organise a concert and raise funds for it. At present, we are funding special wheelchairs and BiPAP ventilators. We are also working on restoration of ponds and sponsoring two ponds in Tamil Nadu where we would be funding for the complete desilting and restoration works. How was your experience working in films? I loved it. It is a totally different terrain. All perspectives change and I learnt a lot of good things from the other side – little nuances yet absolutely constructive. Does music provide equal opportunity and pay to all irrespective of the gender? It is improving though there is still gender bias looming large, even if discreetly. What do you think about free online music sharing? It is welcome. It gives more visibility and widens your horizon. The spectrum of audience reach also expands. Webcasting and online sharing have quite become the order of the day. Free music is however questionable and debatable. Why should music be given free? What qualities should music students inculcate? Humility, respect for the art, music and the audience they sing for. They should diligently practise, be ‘thirsty’ to keep learning and be conscious of what they sing. And finally, patience and persistence.